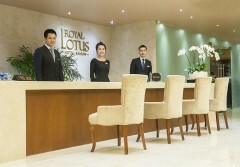 At Royal Lotus Hotel Saigon we provide you with excellent service and superior facilities make for an unforgettable stay. Royal Lotus Hotel Saigon boasts of 173 elegant Classic, Premium, Deluxe Rooms and Suites rooms designed by prestigious French Architecture and Interior Company. Dining at the Royal Lotus Hotel Saigon offers guests a choice of local as well as international cuisines. 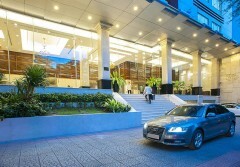 It is one of the top 4 star business and leisure city hotels in Ho Chi Minh city. 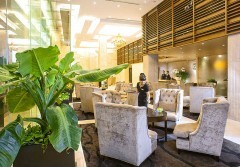 Royal Lotus Hotel Saigon offers a level of service and comfort designed to ensure that both business and leisure travelers who visit this emerging and bustling new gateway city of Asia will find charming hospitality and personalized services. With harmonious combination between traditional Vietnamese structure and modern style with a French touch will bring guests a pleasant experience. Ho Chi Minh city, the former name as Saigon, as it’s known to all but city officials, is Vietnam at its most dizzying: a high-octane city of commerce and culture that has driven the whole country forward with its limitless energy. It is a living organism that breathes life and vitality into all who settle here, and visitors cannot help but be hauled along for the ride. The Saigon experience is about so many things – memorable conversations, tantalising tastes and moments of frustration – yet it will not evoke apathy. Stick around this conundrum of a city long enough and you may just unravel its mysteries.